"The Gray Lady" been exhibiting signs of dementia for decades. On January 13, 1920, it famously ran an article proclaiming that space flight was impossible because there was nothing in the cosmic void for the exhaust to push against. Isn't that typical of the ignorance that the mainstream media applies to much of its reporting? The writers have an agenda to push, and they are not about to let facts get in the way. 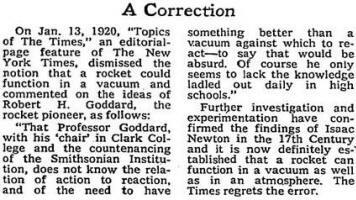 On 17 July 1969, the day after Apollo 11's launch, the New York Times issued this correction over a 1920 story it ran saying spaceflight is impossible. They probably figured best to get it out there before Neil Armstrong and Buzz Aldrin were slated to step foot on the moon. An, enlightenment for the benighted masses who read their rag. 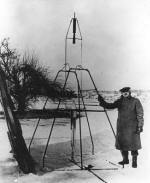 Here is the text: "1969: On Jan. 13, 1920, Topics of The Times, an editorial-page feature of The New York Times, dismissed the notion that a rocket could function in a vacuum and commented on the ideas of Robert H. Goddard, the rocket pioneer, as follows. 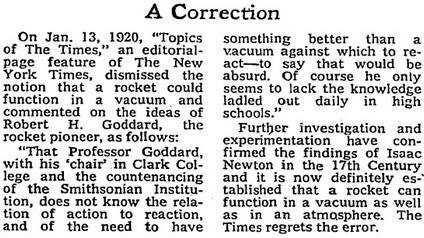 'That Professor Goddard, with his 'chair' in Clark College and the countenancing of the Smithsonian Institution, does not know the relation of action to reaction, and of the need to have something better than a vacuum against which to react -- to say that would be absurd. Of course he only seems to lack the knowledge ladled out daily in high schools." Further investigation and experimentation have confirmed the findings of Isaac Newton in the 17th century and it is now definitely established that a rocket can function in a vacuum as well as in an atmosphere. The Times regrets the error.'" What a display of arrogance! How long will it take them to retract some of the anthropogenic global warming... er... climate change gospel that they have been preaching now that those e-mails from the Climatic Research Unit of the University of East Anglia in eastern England.